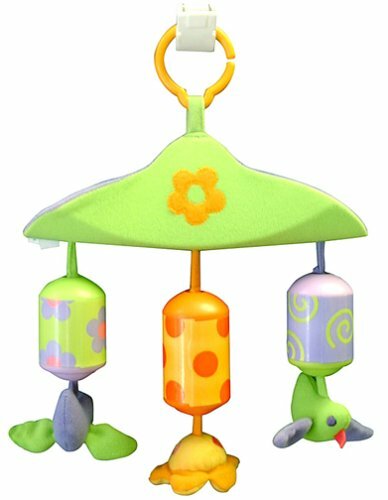 A new and unique kick-toy to hang on your Gymini 3D Activity Gym or Activity Arch (each sold separately), these colorful chimes, in three different colors and patterns, will entice baby to kick or bat, for a healthy workout of both arms and legs. The soothing sounds are sure to delight your baby while teaching cause and effect. My Baby loves to kick! thoroughly entertaining... and no batteries required!! The sounds are soft like windchimes, but not tinny. Doesn't need batteries. Attaches with a regular sassy link or similar. We put ours on one arm of the activity gym and let the baby swat at it with her hand. She loves it!! This was by FAR my daughter's favorite toy on her baby gym. The sound is very pleasant and soothing, the colors are bright, and she loved chewing on the little birds and flower. It's also very durable, because she has chewed on it a lot, and it still practically looks new. Once she outgrew the baby gym, we used some link-a-doos to hang it over her crib, and she still plays with it. Saw that this had great reviews-so couldn't resist when it went on sale. Pro's: Durable, chimes aren't tinny-sound nice, birds & flower stimulate tactile responses, effectively teaches cause & affect. Con's: Wish more stimulating colors were used--even if it wasn't black,red & white-losing the pastels would be more stimulating & attractive to baby. We had ours up for a few days, showing our little one how to use it before she'd give it a chance., Wish fabrics were officially "baby safe" since my child likes to pull them into her mouth. I feel like I'm sending her a mixed message every time I have to pull them out of her mouth...like-starts out "play with your toy"...but then I take it away/out of her mouth-sending the opposite message. I like this item very much, my 3 month old loves it. He likes the soft sounds of the bell and the attached animal toy as well. The colors are not that bright but it definilty grabs attention of my son.The object seems safer as well no sharp edges found. Easier for my son to grab the animal toy in his little fingers. My son loves this toy! Clearly this product has changed since the 2005 reviews here that lament foil that peels off -- my copy has no foil. Maybe back then the now-embroidered flower on the felt body was foil?? I've been meaning to give this toy a 5 star review for some time now. This is one of very few toys that I recommend to all new parents. Our baby loves to lay on his back and kick these. It was really the first toy he ever actively interacted with and continues to be a favorite. This is a must-have. I purchased this for my first born a few years ago, and now I'm about to have my 5th. My eldest is now only 4 1/2 (yes, a kid a year).... so this toy has had steady use. I don't even bother attaching it to the gymini anymore with my 12 mos. old (I only do so when baby can only lie on her/his back and kick...and eventually reach). Now, I just hand it to my youngest to play with, and he loves the soft chiming. We both like these chimes! i now buy this for every baby shower or new baby i know! my mom thinks it made my son extra super co-ordinated!? My favorite thing about this toy is that the windchimes are genuinely melodious to the adult ear, and not too harsh, or "tinny" sounding for a baby's ear (in my estimation). The sound is not too loud and not too soft - HOME RUN! My daughter ADORED this toy. One reviewer mentions they were dissappointed with this because they did not realize it was "only" compatible with the Tiny Love (TL) play mats. This is true, insofar as the attachement clip is the same as what TL uses for all playmat toys. However, I have a solution. We purchased this in conjunction with the Tiny Love Clip and Go Musical Mobile, which comes with the most ingenious "lobster" clip. We used that clip *everywhere* and with multiple toys, including these windchimes. Thus, the windchimes AND the mobile clip nicely to the hood of a bassinette, which is where our daughter would do her "kicks" every morning with these windchimes (she has very strong legs and abs at 8 months, which I predominantly attribute to use of this toy in this manner), and then lay quietly amused by the mobile. When she was about 5 months, she started grabbing the birds and the flower, learning to clutch. Nevertheless, TL should include this "lobster" claw attachment clip with all sold-separately accessories such as the windchimes. This is the reason I gave this toy 4 stars, not five. It is otherwise perfect and fantastic. While you should not have to buy two toys to make one work optimally, BOTH the mobile and the windchimes are TOTALLY worth the money, and I highly recommend both as a perfect pair. 5 months and still loves it! Great addititon to the Gymini!